When message Running in software rendoring mode appears in Linux Mint, the Operating System has a very high CPU usage, perhaps up to 100%. Follow these directions to view the CPU ustage. For this tutorial we will assume that Linux Mint is a Virtual Machine running on Oracles VirtualBox. To enable 3D Acceleration, shut down the Linux Mint Virtual Machine. In VirtualBox, select Settings, click on Display and check-mark Enable 3D Acceleration. 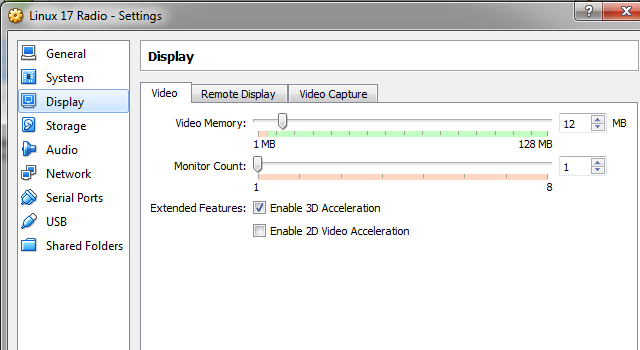 If you are unable to check-mark Enable 3D Acceleration, you might need to install your motherboards video drivers. To verify that the issue has been resolved, recheck the CPU usage, and we should find that the CPU usage percentage is now much lower.